The U.S. 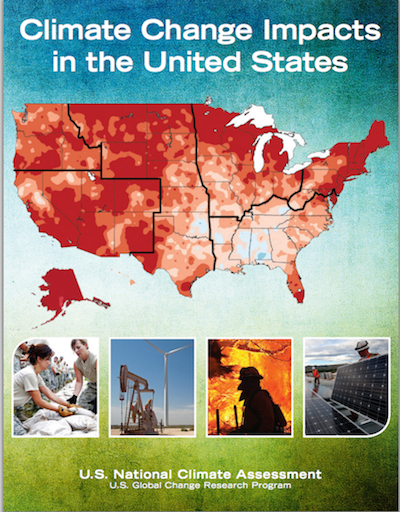 Global Change Research Program has released the Third National Climate Assessment. A 60-person Federal Advisory Committee (The "National Climate Assessment and Development Advisory Committee" or NCADAC) oversaw the development of the draft climate report. The NCADAC, whose members are available here (and listed in the report), was established under the Department of Commerce in December 2010 and is supported through the National Oceanic and Atmospheric Administration (NOAA). It is a federal advisory committee established as per the Federal Advisory Committee Act of 1972. The Committee serves to oversee the activities of the National Climate Assessment. Its members are diverse in background, expertise, geography and sector. A formal record of the committee can be found at the NOAA NCADAC website. A list of the committee’s decisions and actions is available on our NCADAC info page. The NCADAC engaged more than 250 authors in the creation of the report. The authors are acknowledged at the beginning of the chapters they co-authored. A draft report was released in January 2013 for a 90-day public comment period. Over 4,000 public comments were received and addressed by the authors. A panel of the National Academies also reviewed the draft report and published its consensus report. The report was revised by the authors in response to the public comments and National Academies review. NCADAC then submitted the Government Review Draft and the derivative Highlights document for formal interagency review. Final versions of the Third NCA and Highlights were adopted by NCADAC on May 6, 2014, and submitted to the Federal government. The Public Review Draft, Government Review Draft, and NCADAC-approved Final Report can be found below. For more information on the NCA process and background, previous assessments and other NCA information, please view the Assessment section of globalchange.gov. Between chapters, there are some page numbers that are not used. This is intentional and does not reflect missing pages.